Sweet William by Beryl Bainbridge was first published in 1975. 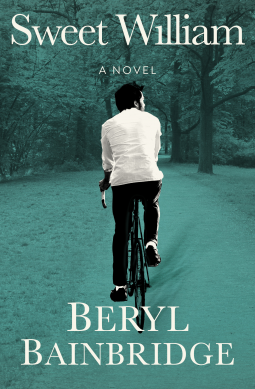 My thanks to the publishers, Open Road Media for a copy of this ebook edition, featuring an illustrated biography of Beryl Bainbridge including rare images from the author’s estate. It’s due to be released in the US on 29 November 2016. I really enjoyed this story of Ann, a young woman whose mother doesn’t approve of her permissive life-style. Ann left her claustrophobic home in Brighton to live in a rented flat in London. Soon after her fiance, Gerald, left for America, she meets William and falls in love with him. But William is fickle and married and Ann can’t resist him, he wraps her round his little finger and does just want he wants. Ann tries to get rid of him but although she knows he is a liar and a cheat, just like the other women in his life she is besotted with him. It’s a simple story, simply told and immensely readable. I wanted Ann to come to her senses and see William for what he was and whilst I soon realised how it would end, I kept hoping that I was wrong. An emotional story that kept me glued to my Kindle, it’s clever, witty and most enjoyable. You’re now the third person I trust who’s recommended this one to me just lately, Margaret. Seems I really must try it. It certainly sounds like a fine read, and sometimes, those simpler stories are the ones that really draw you in. Do try it Margot – I’d like to know what you make of it. I have this on my Kindle, too, Margaret. I’m looking forward to it especially now that I’ve read your review. I hope you like it too, Debbie. Added this to my ‘must-read’ list! I think I’ll make a ‘must-read’ list too! This sounds right up my street. As it happens I’m reading her Georgie Boy at the moment. Katrina, is that Master Georgie? That could be the first of her books that I read many years ago – can’t remember much about it. Is it in the Crimean War? Have you read Bainbridge’s HARRIET SAID? It’s an early work (published before SWEET WILLIAM, I believe) and is based on the same murder that inspired the movie “Heavenly Creatures”. Bainbridge excels at creating that ominous sense of dread–you know something bad is going to happen, but something propels you to keep reading. Deb, I haven’t read Harriet Said! I hope to though. And you are so right Bainbridge’s books do propel you on to keep reading.